Goldenrods are members of the genus Solidago, which includes about 100 species of North American wildflowers and more than a dozen species native South America, Europe and Asia. Giant goldenrods are among the tallest, growing to 2-7 ft. These usually have small heads with yellow pistillate ray and perfect disc florets aggregated into flat-topped, wand-shaped inflorescences. There are many basal long lance-like leaves, below the inflorescences. 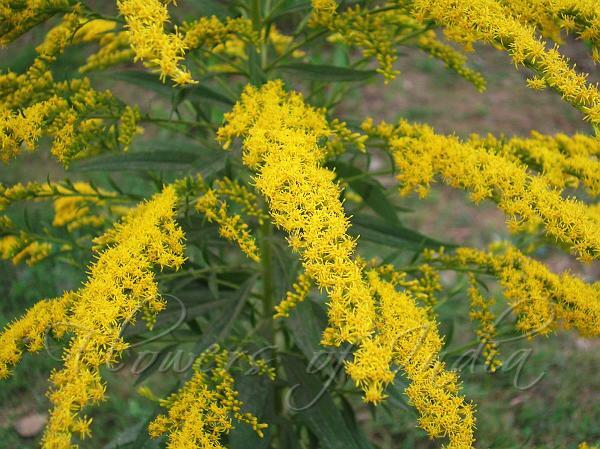 It is widely believed that Goldenrod causes hayfever. It blooms at about the same time as ragweed. Because Goldenrod's flowers are quite noticeable, it gets the blame instead of the less conspicuous ragweed. Folklore: There is an old legend that relates goldenrods to asters. Two young girls talks about what they would like to do when they grew up. One, who had golden hair, said she wanted to do something that would make people happy. The other, with blue eyes, said that she wanted to be with her golden-haired friend. The two girls met and told a wise old lady of their dreams. The old lady gave the girls some magic corn cake. After eating the cake, the girls disappeared. The next day, two new kinds of flowers appeared where the girls had walked: Asters and Goldenrods. Photographed in Sundar Nusery, Delhi.